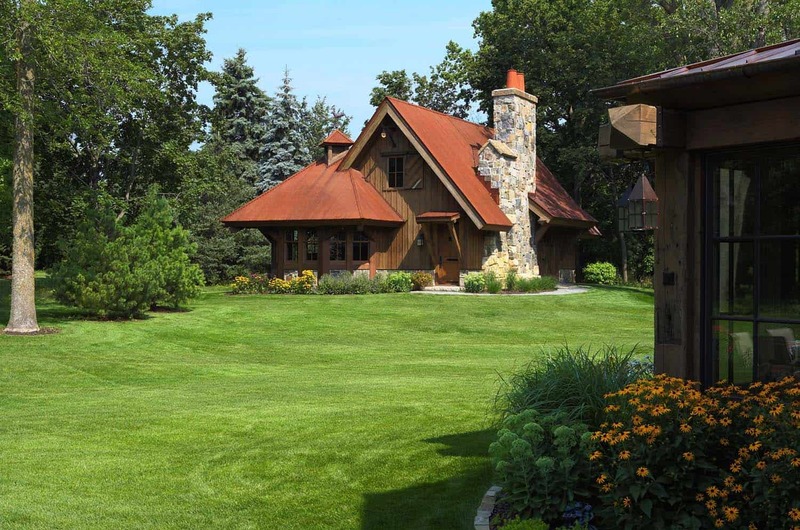 This traditional style family home was designed by Murphy & Co. Design, located on a serene two-acre site in Woodbury, Minnesota. 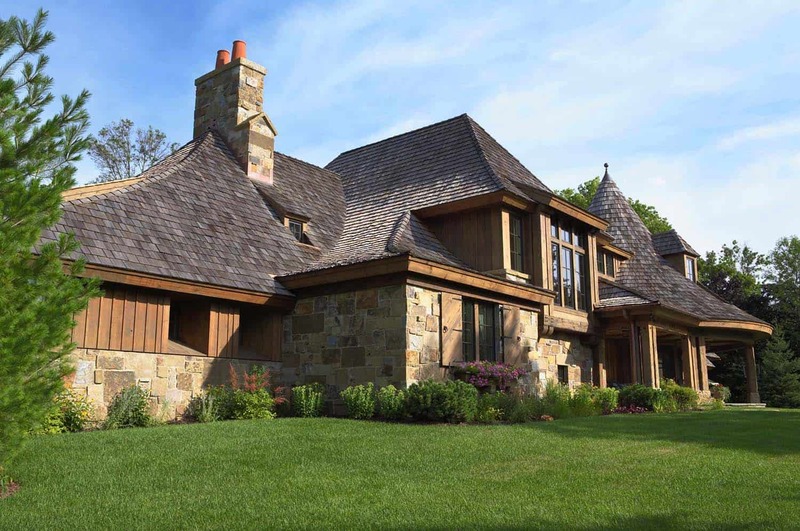 The architects describe this home as a synthesis of northern European architecture and refined rustic domestic influences. 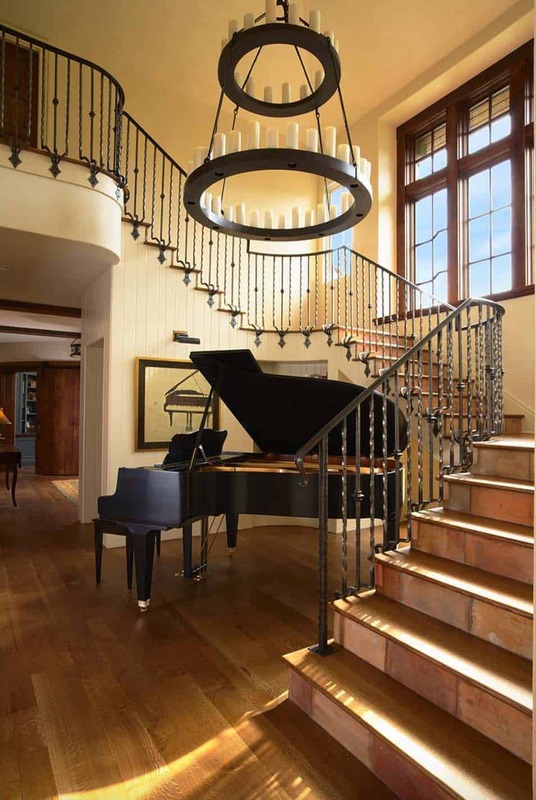 With a timeless design aesthetic, this beautiful home enjoys a contemporary lifestyle. At the heart of this dwelling is an open plan dining, hearth, kitchen and porch area. 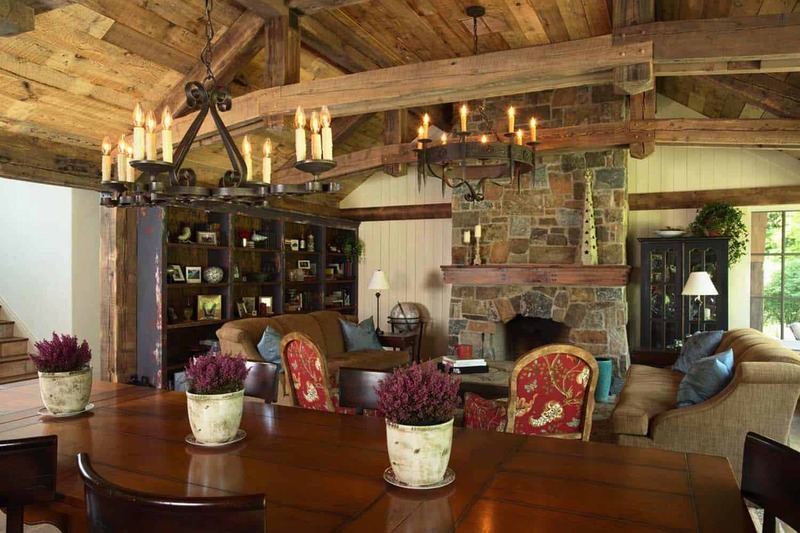 The reclaimed posts, beams, and plaster interiors were designed to remain cozy, yet provide plenty of space for entertaining and family gatherings. 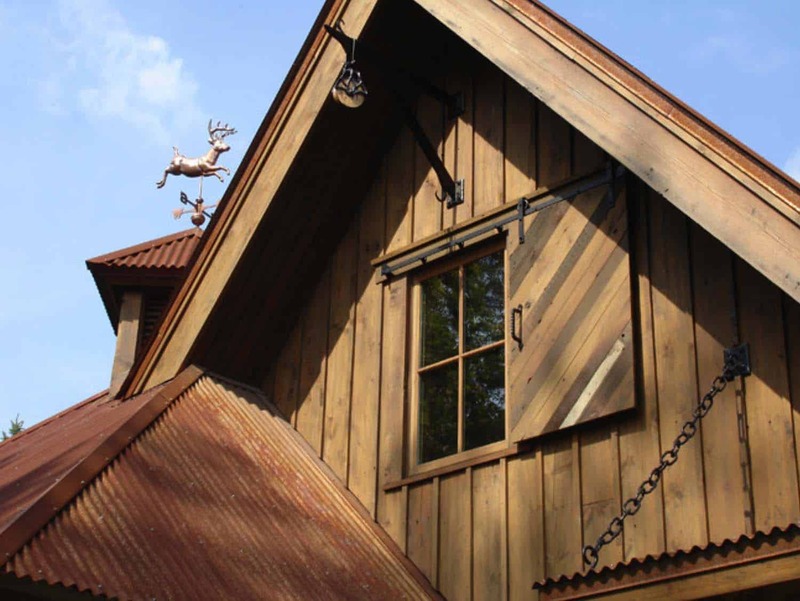 Above: The front exterior facade features reclaimed barn siding. 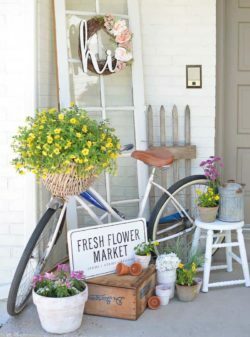 What We Love: This northern European style home reflects a beautiful and unique styling both indoors and out. 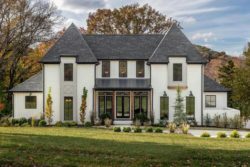 There is a timeless quality to this home with its exquisite craftsmanship with meticulous attention to detail. 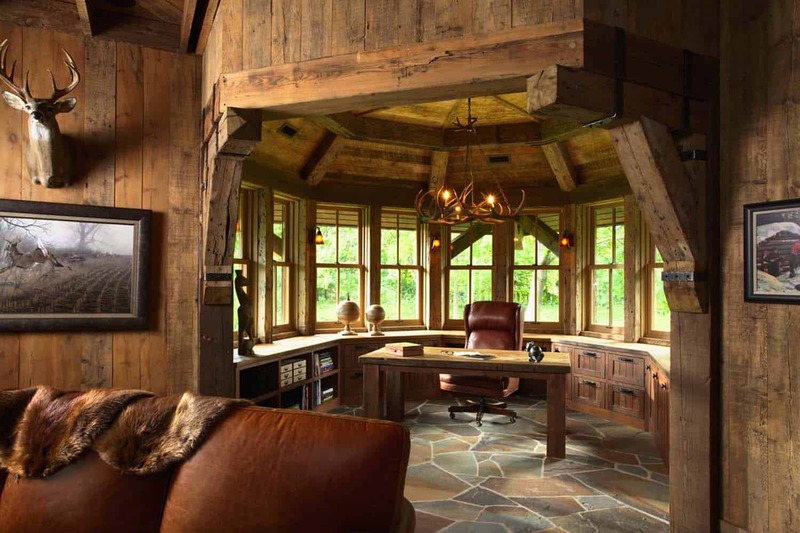 We are especially loving the home office and the “man cave”/hunting shop — what a fantastic space with all of those storage options and barn-like feel. 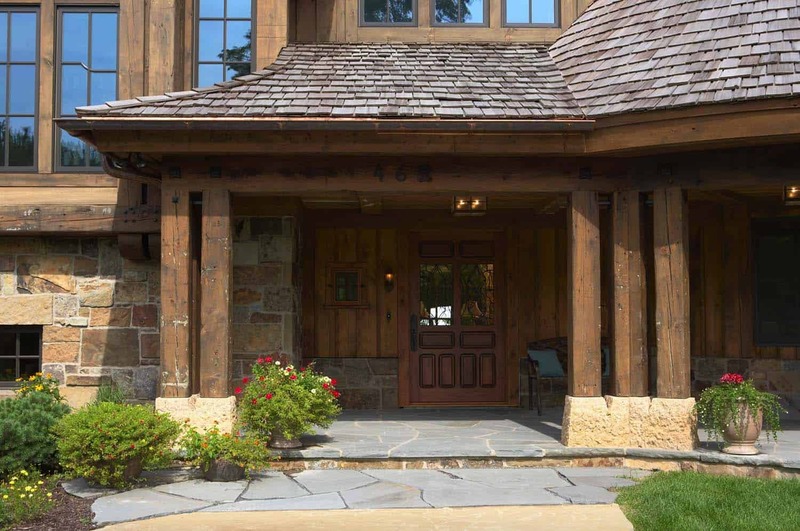 Overall this home is stunning, we could feel right at home in any of these spaces, especially the cozy porch! Readers, please share with us what details in this home you find most appealing and why in the Comments below! 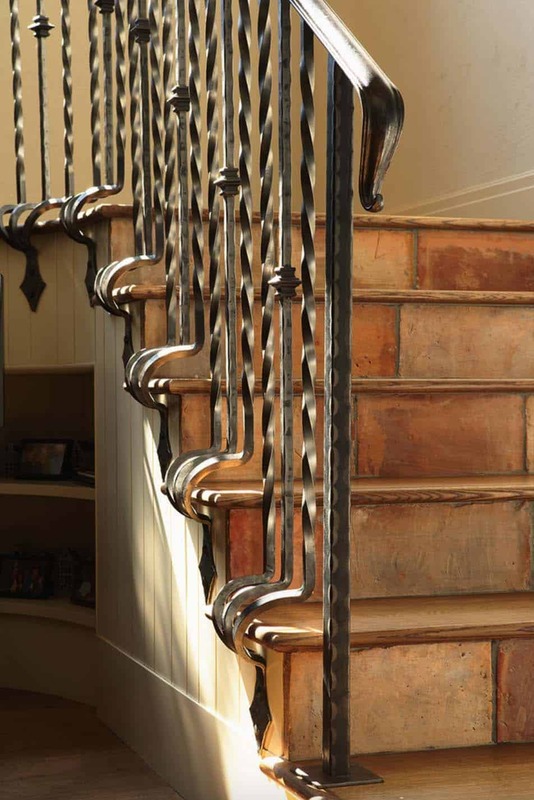 Above: A custom designed iron railing features alternating twisted balusters and knuckles. Above: The great room features wood-pegged timber trusses. 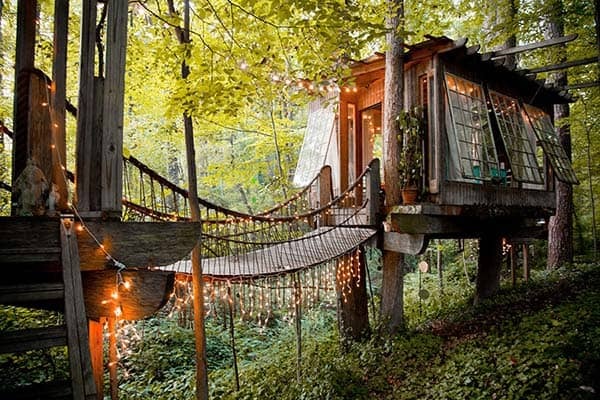 Above: The chairs at the island are a custom design from a California-based company called Bausman. The fabric is Clarence House. 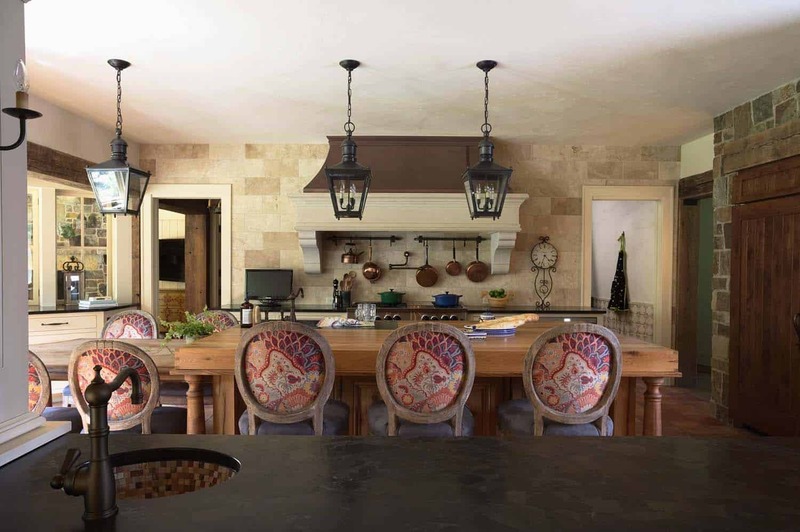 In the kitchen, a carved stone and copper range hood are set against a travertine wall. 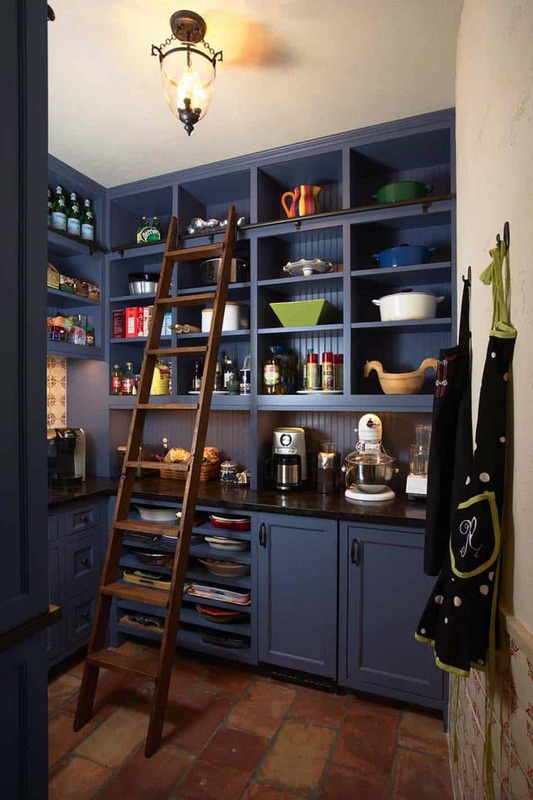 Above: The overall size of this pantry is 7′-2″ x 8′-2″. The base cabinets are 24″ deep, and the upper cabinets are 14″ deep. The pull-out shelves are approximately 2′-6″ wide & split into 6 spaces (36″ high counter). The rolling ladder is from Bessler. The flooring is an antique Terra Cotta tile. Above: A hammered copper main sink is set in a windowed wall. 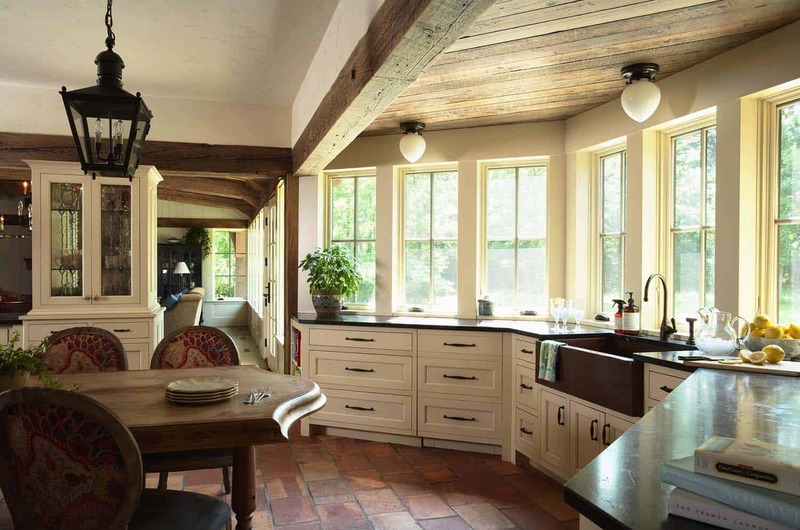 The beams on the kitchen ceiling are reclaimed, from Big Wood Timber Frame. 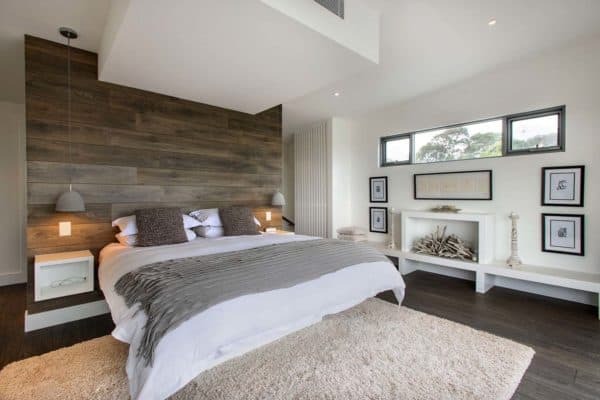 The wood on the ceiling is reclaimed boards with a natural “weathered” finish on them. 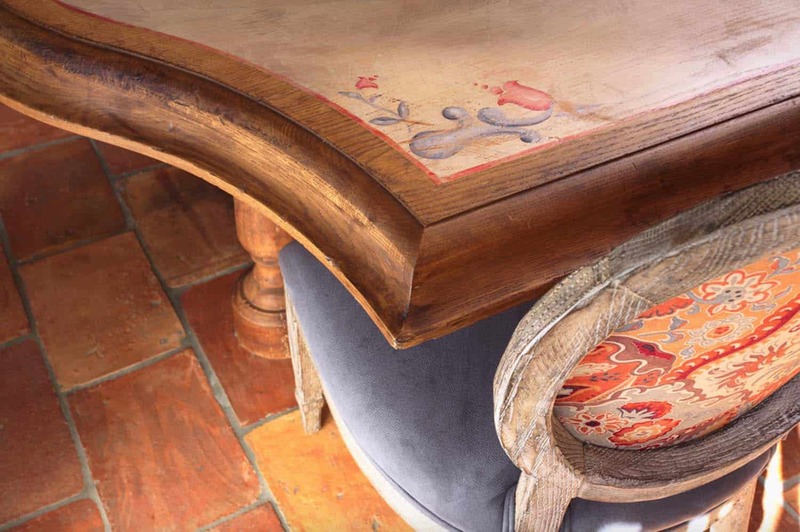 The flooring is a french terra cotta tile. Above: Windows connects the kitchen to the enclosed porch. 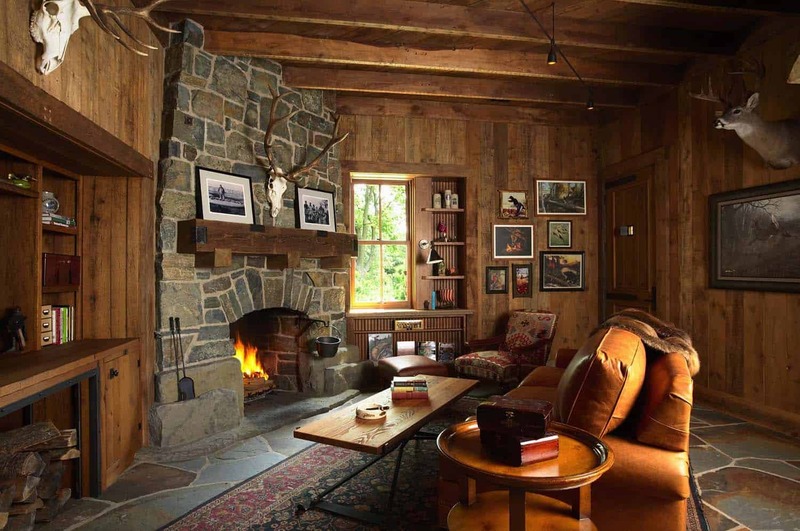 Above: The mantel above the fireplace is approximately 5″ thick and projects roughly 12″. The windows are Marvin units — approximately 33×78. Ceiling is reclaimed fir, and it is butted together. The ceiling above the exposed joists is insulated (2×10’s and spray foam). 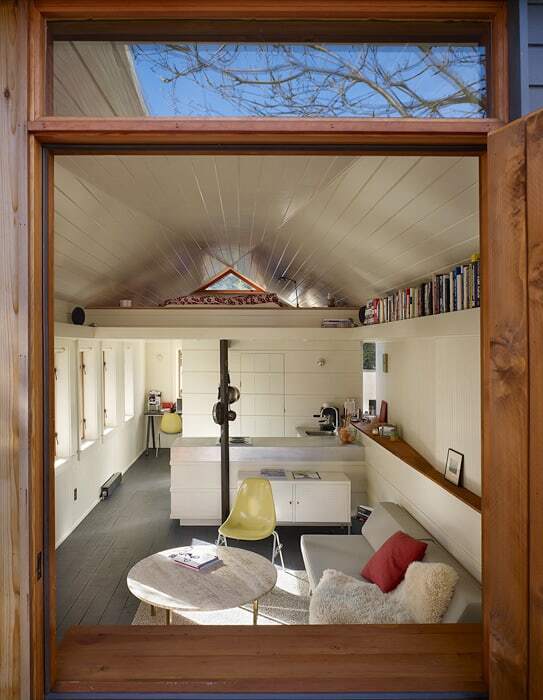 Overall, the dimensions of this enclosed porch are 17′ x 18′. 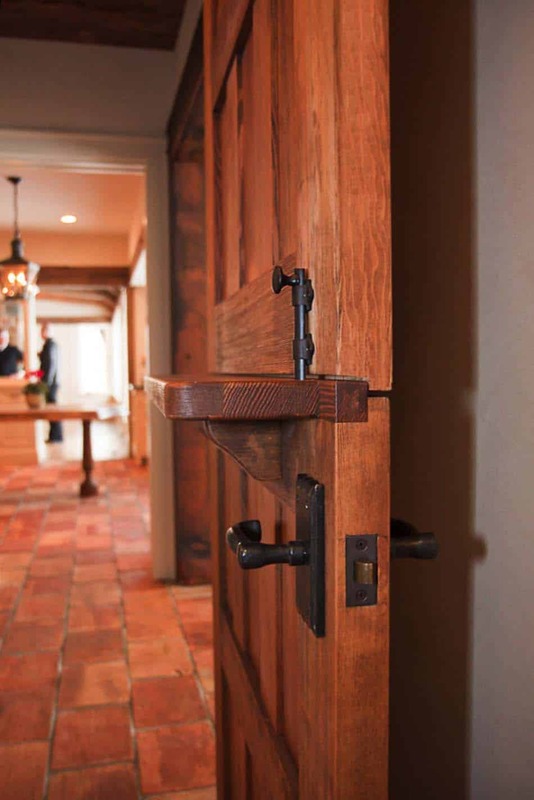 Above: The dutch door is a custom designed door built by a local millwork contractor. 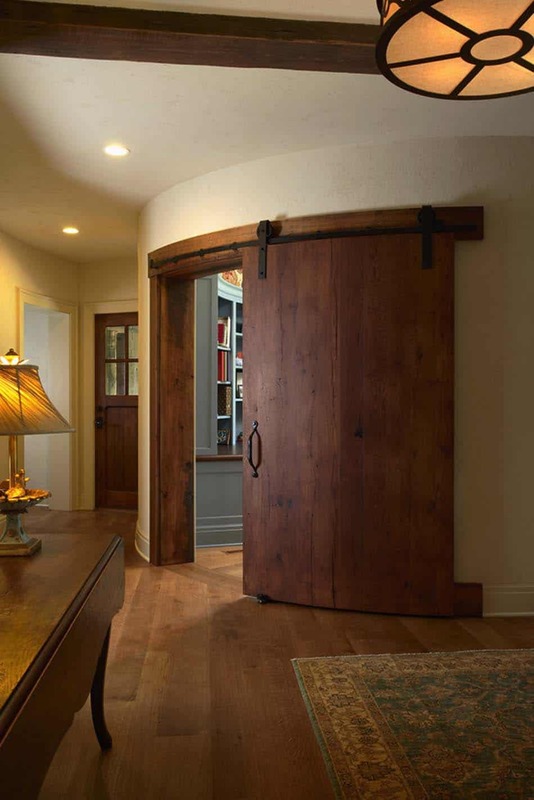 Above: A curved sliding barn door was a custom design and custom millwork build. The door on the right is an exterior door. The opening to the left leads to the rear stairs, mud room/closet, and powder room. On the floor is a Oushak style rug with lighter blue tones. Above: A main floor study is set within a turret with an upholstered wall. 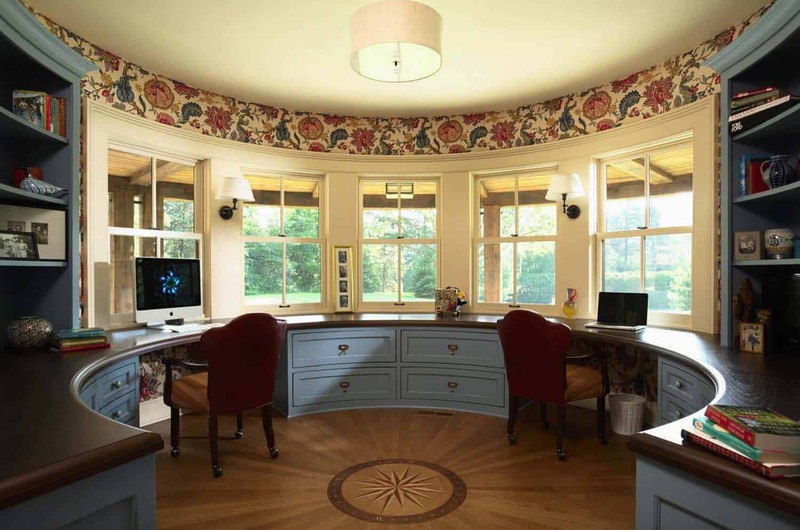 The custom built-in desk was designed at 28″ deep round base cabinets/counters. The wood flooring features a wood medallion in the center, similar can be found by running a Google search on “Nautical Wood Medallion”. 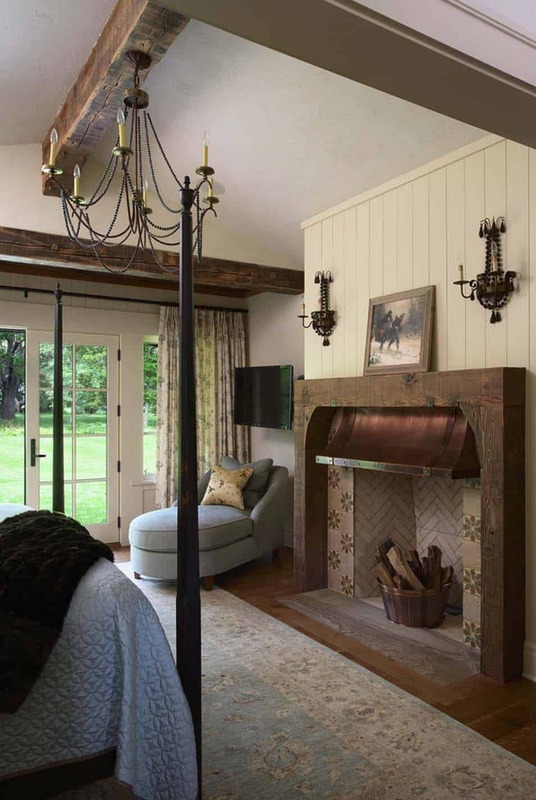 Above: Master bedroom retreat features a fir mantel, riveted copper hood, and tile surround. 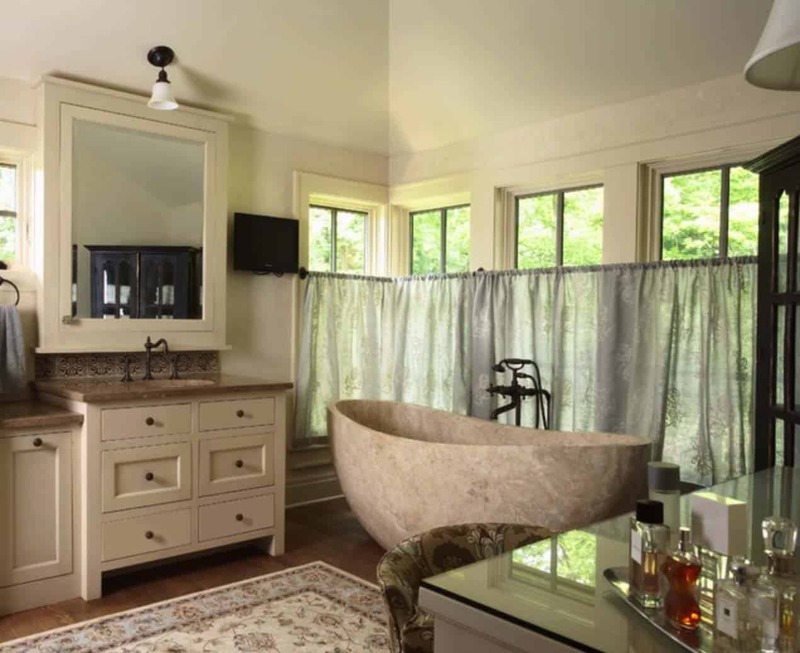 Above: The master bath tub was carved from single block of travertine stone, a special order from The Tile Shop. 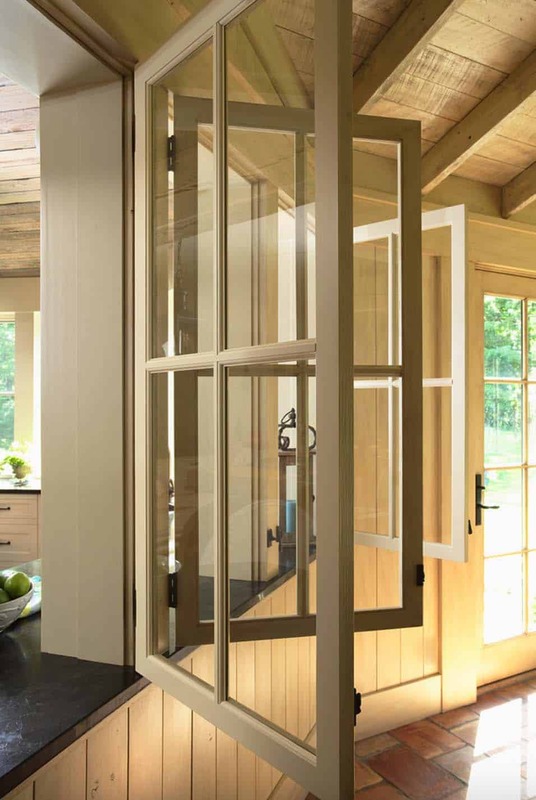 The mirrored medicine cabinet is 3′-2″ wide x 4′-0″ high x 4″ deep. 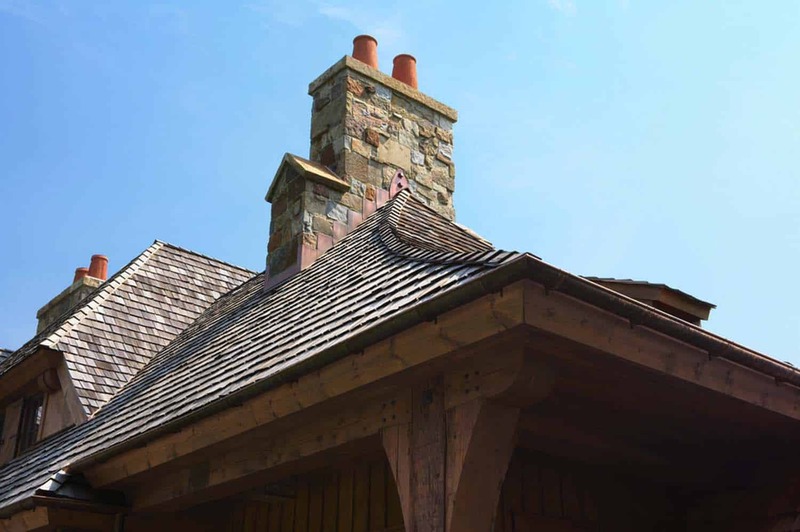 Above: Detail view of master bedroom retreat roof and chimney. 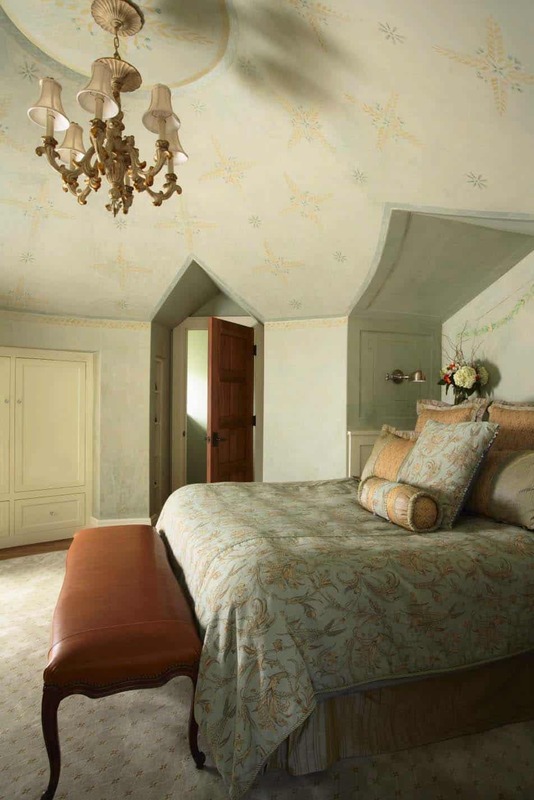 Above: Round guest suite is located in the turret, hand painted in traditional Swedish folk art style. The bedding is Hepburn by Eastern Accents. 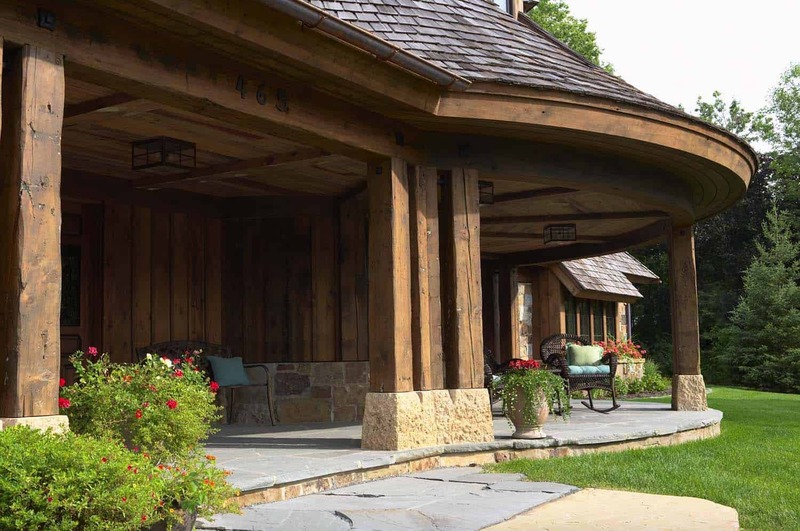 Above: Detail view of open porch featuring barn board soffit and blue stone floor. 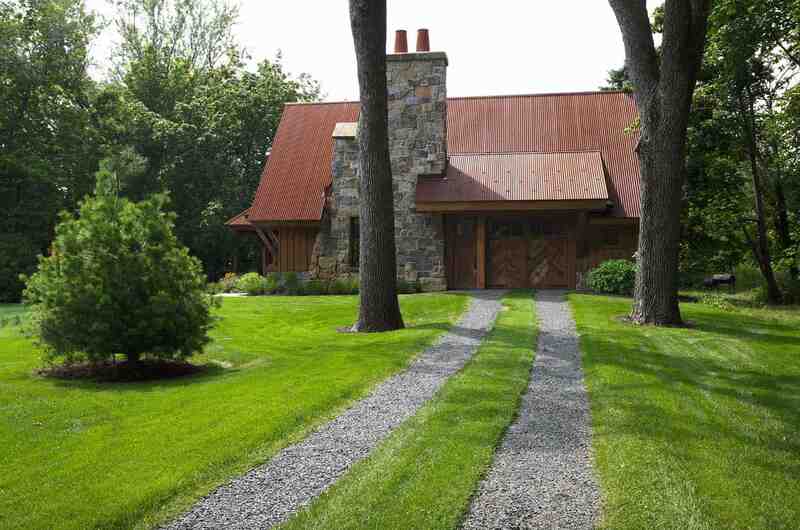 Above: On the exterior, beamed roof supports and a Corten roof adds to the overall timeless aesthetic. 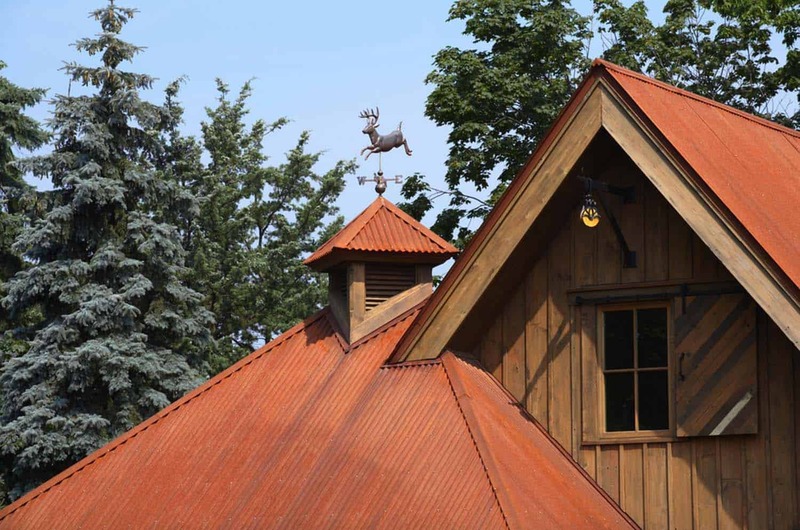 Above: Also on the property is a rustic barn, which serves as a multi-functional companion to the main house. 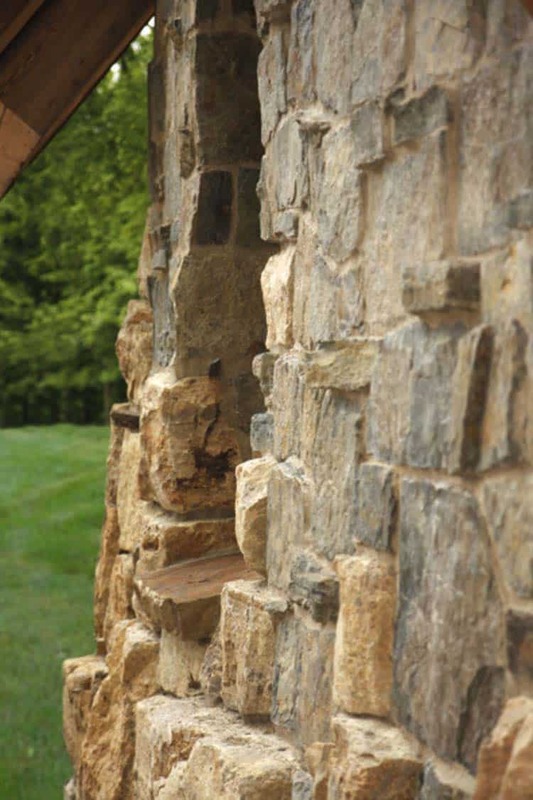 This structure is accessed via a meandering stone drive path between mature ash trees. 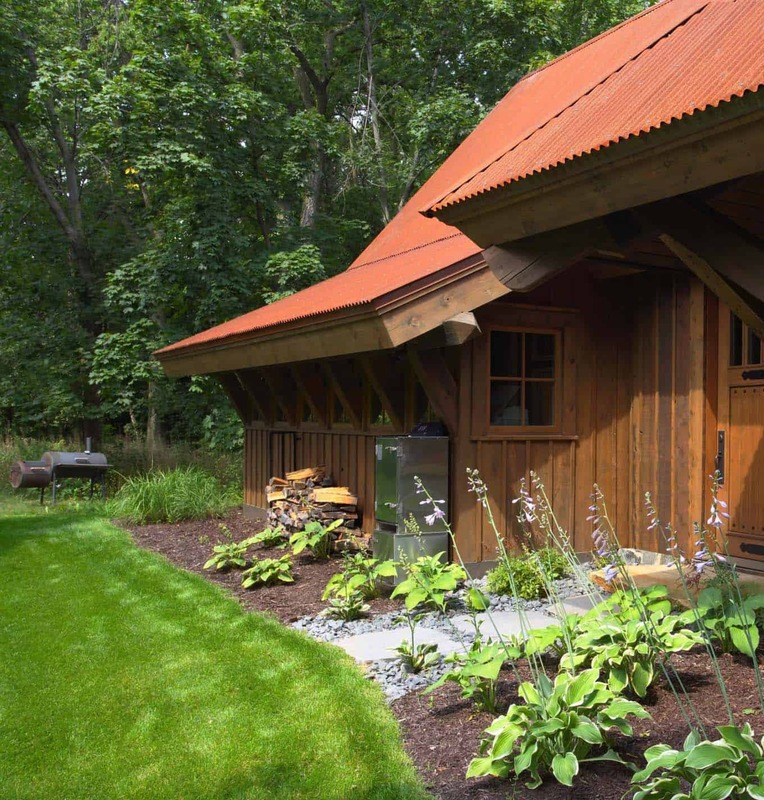 A rusted steel roof offers deep shelter over a reclaimed wood and battered stone exterior. The siding is wood and stone. 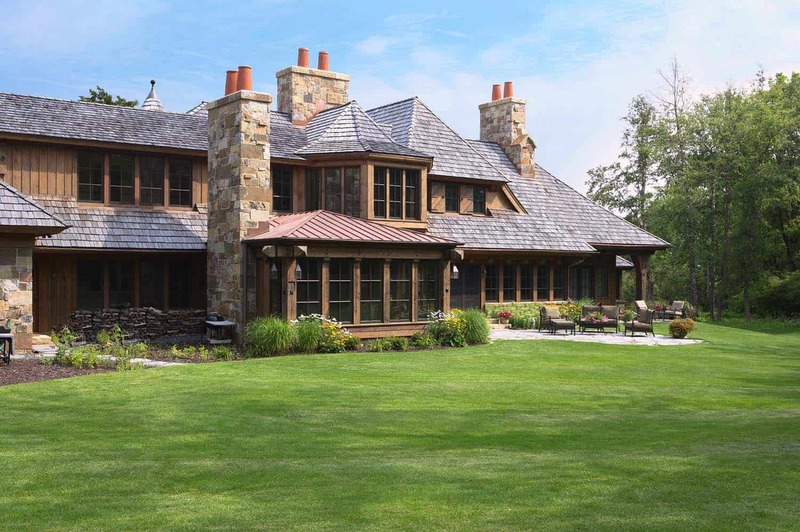 The roofing is a corrugated “Coreten” product, while the windows are Marvin wood windows. 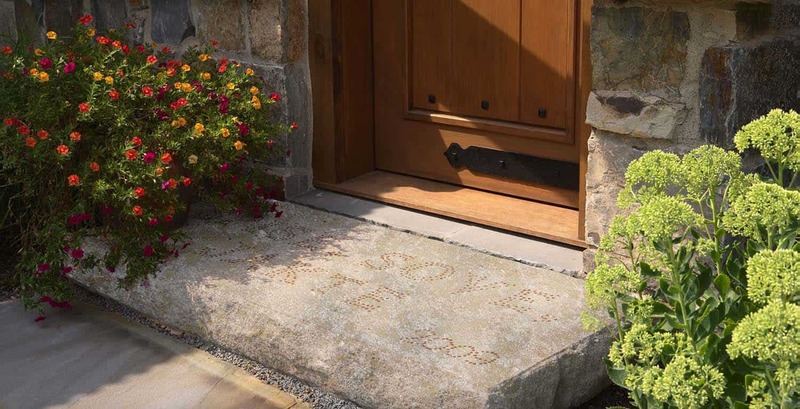 Above: This entry pad was made onsite, nails were inserted into the concrete while it was curing. 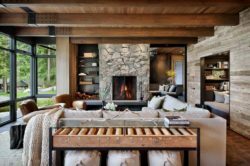 Above: This cozy sitting room features a large stone fireplace with authentic iron cooking hardware, and a desk alcove surrounded by glass. The walls are clad with 1×8 wall boards. 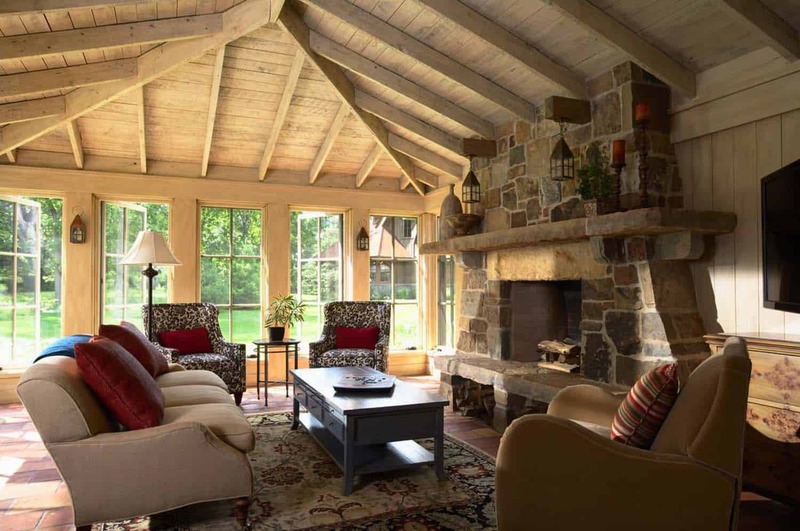 The fireplace features natural stone called Loon Lake. 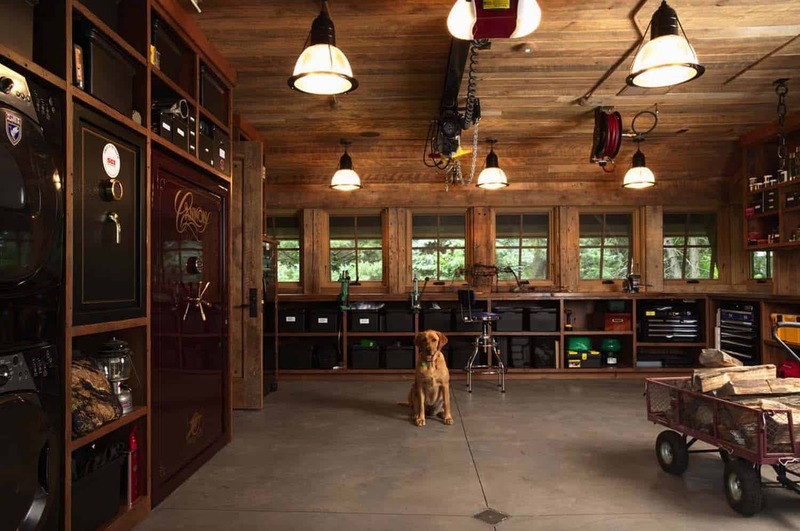 Above: The Hunting Shop includes a track-mounted ceiling hoist, ammo loading bench, washer and dryer, and a modern day outhouse. Light fixtures are holophane pendants. The windows are Marvin wood awnings. The wood is reclaimed Douglas fir that was skip-planed. 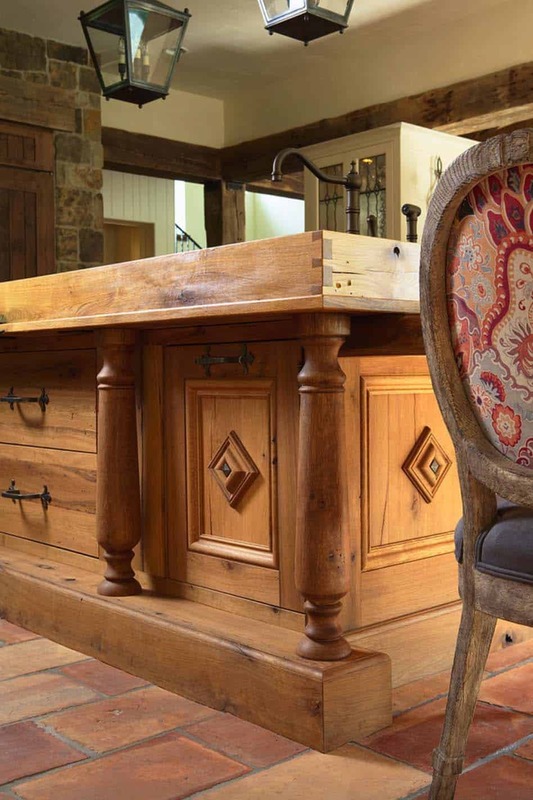 To look for reclaimed wood similar to this space, try your local lumber yard. This space is 20′-3″ wide x 24′-11″ deep.